Outreach is most commonly associated with the idea of ‘building links’ through emailing bloggers, however there is a lot more to outreach than some people may think. Social is a good way of engaging people and can be a great way to add a personal touch when reaching out to customers. Why is social useful when it comes to outreach? Although blogging is still a good way to communicate with customers, using social media is an easier way to contact and engage in a faster and much more interactive way. In 2006, Twitter was created for people to share a short burst information to their followers, making it easier to communicate and to engage than any other social activities. In 2007, the first hashtag (#) was used in a tweet as a way to related thoughts and information. This makes hashtags and tweeting a useful tool for outreach. This tweet was retweeted 13 times and has 13 favourites, this is why this tweet is a perfect example of why social is important for outreach. It’s very personal and engaging as she approaches the bloggers in a public yet personal way, instead of ‘cold calling’ them through bulk emails. Being contacted by a real person, rather than a faceless email address, also contributes to the personality of the contact. You would also be less trusting if it was a profile with no image. She has used three very important hashtags: #interiors, #homedecor and #prrequest. These hashtags are ones that are related to the audience she is trying to contact so anybody searching for these topics will instantly find this tweet. However, if no hashtags were used then it would most likely get lost or have requests from unrelated people. Asking people to retweet is also a good way to get people to spread the word about her request, without her having to retweet the same tweet again. Since 2004, Facebook has been growing bigger and bigger. Once just a site for social use, over the past few years it has become a great platform for business. Hashtags – Use relevant hashtags so people can easily source your post. Ask questions – Asking is much more of a kind approach, rather than telling people. Use media content – Adding images or thumbnails will give people the ‘click factor’ as it’s more interesting and appealing. 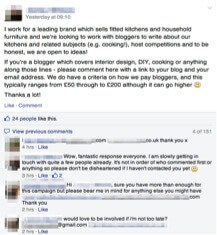 Facebook communities and groups are another great way to reach out to potential customers. 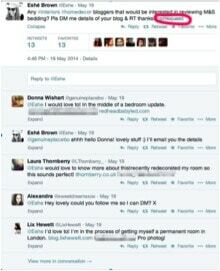 This post is from a closed group, which allows PRs/outreach guys and bloggers to have open interaction. Here you can see that this post has loads of description about the company and what they have to offer. They received 151 comments and 24 people liked the post. This is a good way to engage people with just one post. This free tool is a perfect, easy way to find people related to what you are trying to market. You can sign up with your/your company Twitter profile. Then you search what you’re looking for by typing into the top search bar. Also you can specify the location of Twitter profiles you would like to reach. 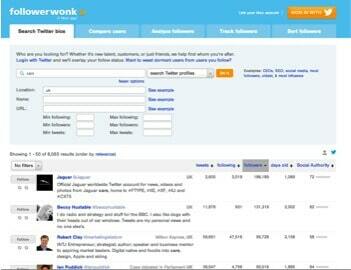 Followerwonk will then bring up a list of all the people related to the topics you have searched for. You can then follow those people, which is a way of reaching out to a relevant target audience. Although it’s quite simple, it is also very useful. On Twitter if you typed in ‘cars’, you will then have a Twitter feed of people who have mentioned or who are interested in cars. The search bar for Facebook can help you find relevant groups and communities. BuzzStream is a really useful tool for blogger outreach. It can be used to build up a database of target websites, their contact details, stats about their site and also the social profiles. By using BuzzStream you don’t need to separately search for blogs and their social profiles and this makes contacting them a lot easier. This also means that once you have contacted a blogger on social you can then approach them through more traditional forms of blogger outreach without just appearing out of the blue. So is social useful when it comes to outreach? Social is very useful when reaching out to site owners as it allows companies to engage with a much wider audience, in a more personal, friendly and warm way. What tools do you use for blogger outreach? Please let us know in the comments below.